31 Testimonials Found for 2017. Click HERE To Enter Your Comments and Rate Your Stik! I am VERY pleased with my 6 StepinStik Natural Wood Stiks. I will keep them forever! My BubbaStik is a really comfortable cane and walking stick. It fits well in the hand and has a nice weight and feel. I appreciate that it was ready to use right out of the box, as it was crafted to my specifications. I just received my third StepinStik Exotic. This one was the Black Dyed Brazilian IPE StepinStik Exotic with the chrome top. The quality of all the stiks that I purchased from BubbaSam are truly exceptional and this last one is just perfect! The customer service that you receive from BubbaSam is superb! Thanks for your products and your customer service! Just wanted to say thank you. It is all too rare to have the owner of a business get personally involved like you did. The parts I ordered came in today and I have already put together my new Bubba/StepinStik. I now have 4. It is a real pleasure doing business with you. I don't know what happened but thank you for the tracking number and thank you for all my stiks. I will use them for the rest of my life. I have recommended BubbaStiks to a couple of people. They are sturdier than the metal canes. It is worth the money and time to order them. Thank you again. I have really been glad that I found BubbaStik. I found my first stick at Love's Travel Center but it didn't fit right, so I gave to a friend that really needed it. I ordered my 1st stik last week and I love it. I decided to order another stik as an extra. They are very comfortable to walk with, help me stand up and keep me from falling when I loose my balance. I would recommend Bubba to anyone needing a cane. Thank you very much. I meant to email you a while ago but my blonde little brain kept forgetting. We got the Stik and it's absolutely beautiful! Jon loves it and thinks it's great! Just wanted to let you know that we totally approve and are very happy with your work. I got my first BubbaStik at a Loves truck stop on I27 in Amarillo, Texas, about 15 years ago. Since then I have gotten 2 more from you, BubbaSam. I have gotten all the Accessories to dress all three up and I get positive comments about all 3 everywhere I go. I could not be happier. One looks like Pecan wood with a Brass hame, the one from Loves, one of them from you is a StepinStik Exotic Birdseye Maple shaft with a Copper hame and the last is Aromatic Cedar StepinStik Exotic with a Black Chrome hame. Wish I could get one of every Exotic you make, but I do have to eat. Thank you for making the world a little better place. Folks, ya just gotta know "BubbaSam" don't build bad Stiks!!!! Now what he does build is just a Straight Up", "Down Right", "Custom Built", "Dress Right Dressed", "Spit-shined", and "Marching Time".... BUBBASTIK or WALKING STAFF! (completely, 100% your Design) of course... there are just something's even Ole' BubbaSam himself can't make work. LOL!!!! It ain't much, but we (customers/designers) tend to "over -accessorize" (kinda like the must have, need that, of course I'll use it, and ya jus never know, tools in our toolbox). Point here is, BubbaSam, is gonna politely let you tell him where you want all them "Oooooh's" and "Aaaaawww's" you placed??.?. YEP ,THAT'S RIGHT!!! Your Shopping Cart... For your Design" exactly, Just where you have it fitting in your Design then, "and this part is awwwwwsome" he will discuss each and every piece of your design, and assist you with his expertise ( ya know, the Custom Built part) and MAN!! I MEAN TRULY CUSTOM BUILT" remove, those ooooooh's and Aaaawww's that you already know won't fit, and adjust your "don't go there's" ensuring you are receiving that "designed by You, Custom Built by "BubbaSam" BUBBASTIK OR WALKING STAFF!!!!! Tell ya Why!! He has a ton of , "oooooohhhh's and aaaaaaawww's to put in your Design for the "Average Joe" (speaking only to Height, disclaimer... for those who are offended by "Average Joe) and for you Taller Joe's like myself, 6' plus. (I'm 6'3" for ref.) he will us build you "all previous adjectives " and Redneck Boasting stuff already boasted above in a WALKING STAFF, truly my choice. Hey all the funn'in aside .... ABSOLUTELY !!!! FIVE STAR RATING FROM TIME OF ORDER TO DELIVERY FOR HIS CUSTOMER SERVICE, his Finished work of the BUBBASTIK / WALKING STAFF .... FLAWLESS!!!!! I normally don't write reviews but this time I have to. I bought two BubbaStiks 10 years ago at a truck stop because I was having a Knee problem. I used them for a couple months and threw them in a basement closet. Fast forward 10 years and I now have arthritis and need a cane to walk. I came across these two, pulled them out and wiped the dust off with a wet paper towel. They look like new... as good as when I bought them. I cant believe that after 10 years of neglect that the brass isn't tarnished or pitted and the wood looks new. You guys have really impressed me with your quality product. I use them everyday. I love the quality of both my new Exotic StepinStik & BubbaSam for helping me with my questions about the USA Medallion. Your website is perfect & easy to use. The beeswax w/orange oil sample you sent is greatly appreciated. The fact I ordered on Monday & had it by Friday with out paying extra is unsurpassed by anyone. I have already given out all the cards you sent. With the Strength, Beauty & Individuality of exotic woods as well as the price these just can't be beat. I was looking at the Tigerwood but when I saw the Jatoba on sale I couldn't pass it up. Im a heavier guy so finding a stronger cane is must. I love the quality, finish & it feels like I have used it for years already. 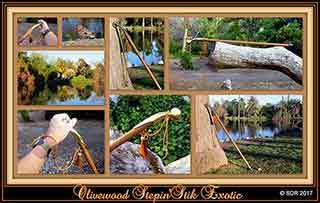 I love hiking & seeing the quality & comfort of my Exotic StepinStik I will absolutley be buyinig a Exotic StepinStaff soon & just maby a THUMPER just for fun! On January 2015, I purchased three canes, one finished and two unfinished. As an Army Veteran that was going through a rough patch, getting my hands "dirty", finishing the two canes and then utilizing them was the therapy I needed. Outstanding product and even better service.